In this review, we are going to have a look at the entry level robotic lawn mower from Robomow for smaller gardens. Robomow are a company with a fantastic reputation for building quality robot mowers and have a large range to suit most customers needs. The subject of this RC304 review may be the entry level machine from Robomow, but it is a very good quality mower that has many great features and will work well in a lot of UK gardens. This is a very popular model in the UK as most of us don’t have huge lawns but we need to save as much time as possible as we have hectic lives. This is the perfect mower for the average size new build garden and will keep it looking brilliant. The cut you get from the RC304 is brilliant and has some great technology to help it. The edging mode allows the mower to cut right up to the edges giving a very nice finish to your lawn. The cut height is an easily adjustable control that allows grass length between 15mm and 60mm. This robot mower is also not afraid of long grass if it needs to really tidy up an area. This is something some other robotic mowers struggle with a bit. The blade is a single blade that is easy to change and very tough for a great performance. The blade needs to be changed once a year. Now we are going to have a look at the individual features that the Robomow RC304 has to offer. It has some cutting edge features and is a great mower built to cut lawns effectively. If you like lots of gadgets then this could be for you as it has a lot of extra features to other models on the market including a smart phone app! The RC304 is limited to maintaining lawns up to 400 square metres which is not that big for the cost. The Landroid M is capable of double this capacity and is slightly cheaper. Saying that, if your lawn is under 400 square meters you will be very happy with the RC304. It will cover the majority of UK homes lawns. The lawns can also be broken down into three zones, the RC304 will take itself between the zones and cut the areas before returning to its charge station. The RC304 can deal with maximum slope angles of 36% which is fairly standard for robotic mowers in this price bracket. That is a fairly steep bank but remember to measure your lawns slopes to be sure it will cope. If it won’t there are models on the market that are designed at tougher terrain. The sensor will make sure that the lawn on the slope if cut just as well as on the flat as the mower will be balanced to counter act the slope. This is an expensive tool to leave outside all of the time and a lot of people are concerned about security. The RC304 requires a pin code to be entered to operate it. If you don’t know the code it is useless. They are also paired to the base station so need both parts to work. This system will deter most would be thieves. This model does have a rain sensor and will put itself away when it senses rain and will start mowing again once the rain has gone, always remembering where it has and hasn’t cut! This is an important feature as the lawn will not have such a good finish if it is cut when it is wet. The mowing schedule that you set will be adhered to around the rain. This is a nice feature that many models in the same price bracket do not have. The Robomow RC304 can be set up and re programmed from anywhere in the world with your smart phone app. If you are out and about and think you would like the lawn cut for when you arrive home then just tell it to start mowing through the smart phone and you will come home to the perfect lawn. The motor is a 200 watt brush less electric motor that is very quiet when it is working. The Battery is a high quality and long life lithium ferrum battery that take around and hour to charge and gives a work time of just under an hour. The motor and battery do not need to have such a large capacity for the smaller lawn size this robot lawnmower will look after. The lawn area is marked out using the standard wire perimeter to map out the area you would like cut. This is pretty simple to do and won’t take long. This model is aimed at the small gardens so should be a very quick set up and you are away. The lawn can be broken down into three zones that are linked up with the perimeter wire so that the RC304 can trundle down connecting paths to mow different areas. This is a good effective system that won’t let you down and works best if you don’t have too many obstacles in the middle of the lawn. There are plenty of good safety features on this model to make it a safe tool to add to your collection. The lift and tilt sensors will cut the blade out instantly if the mower if lifted up or tilts so far that it may fall. As with many of the models in our reviews, the bump sensors also immediately cut out the blade and the Robomow will change direction to avoid any more contact. There is also a child lock on the controls to stop any children messing around with it. Looking after these mowers if nice and easy. They are sold by many large UK retailers and spare parts are easy to purchase. The RC304 is built to make it easy for parts to be changed easily by the owner so maintenance needed should be very low. As long at the blade is changed every month you should be okay to keep going. The Robomow RC304 comes with a three year warranty which should give you piece of mind that this is a quality product that is built to last for many years. A long warranty is a good sign that the product is high quality and the Robomow customer service team are always on hand if need any advice. 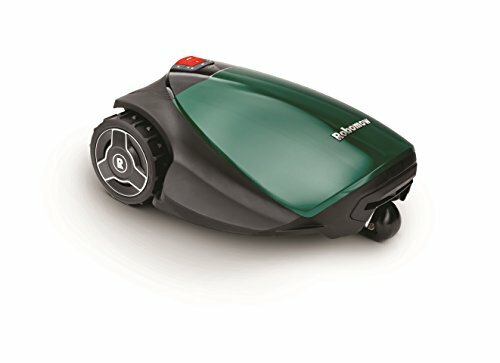 This is a very high quality robotic mower from a company with a great reputation. In terms of value for money it is quite expensive for the size of the lawn that it will deal with (compared to other reviewed models) but is still a great investment for the average size garden in the UK. We would highly recommend the RC304 based on the fact that it has great reviews and has a great warranty and back up. The extra gadgets are also a nice touch. A very good mower but there is better value to be had at this level.